On April 18, 2012, an email was sent out by the government to immigration workers and support agencies inviting them to attend a debate in the legislature the following day over a NDP motion to request the Federal government back down from their plan to take over certain immigration programs. After 9 months of relentless investigating and questioning by the press, the opposition and the provincial ombudsman, a minister has been kicked out of caucus and we still don’t have a complete picture of what happened. It is a testimony to how a government that spends too much time in power can build a wall around itself and prevent the kind of scrutiny needed to keep the government honest and accountable. The cat was out of the bag the day before the event even happened, yet the government didn’t acknowledge its role. When challenged the following day with an email from Assistant Deputy Minister Ben Rempel, the government shrugged it off saying they were simply responding to concerns raised by the service agencies. Had the Premier taken charge when this first became an issue and said: “Yes we invited them to take half a day off to attend the event, and this is why: <insert explanation here>”, then the story would have been put to rest. That doesn’t make what they did right or proper, but it would have killed the story pretty quickly, especially with the PST hike still sending shock waves through the population and the media. But he didn’t do that. Not only did the Premier fail to take responsibility, but the Minister of Immigration, Christine Melnick, took no responsibility either. She denied any involvement in sending out the email, and brushed it off as normal communications when questioned about it by the press. And so it went on: question after question after question. Being evasive in a legislative debate is one thing, but lying to a committee is a whole other level of dishonesty. One that could potentially result in jail time. Yet these are the lengths that Melnick went to, in order to avoid owning up to the truth. Is it possible that Melnick’s undiagnosed diabetes caused her to misunderstand the question? This highly dubious excuse may be enough to keep her out of prison, but more likely she was doubling down on her previous lies, hoping that at some point the story would die. The story did not die. The Canadian Press filed a freedom of information request that produced documents showing that more people in Melnick’s department had a hand in sending out the emails than previously thought. It became clear that this wasn’t just the action of one person, but an orchestrated effort. In spite of this new evidence, Melnick continued to insist that the ADM acted on his own. Much later, in December 2013, an ombudsman’s report is made public, showing that Melnick did in fact direct the ADM to send the email. It was clear now that the minister lied, and she had been covering this up with her evasive answers. 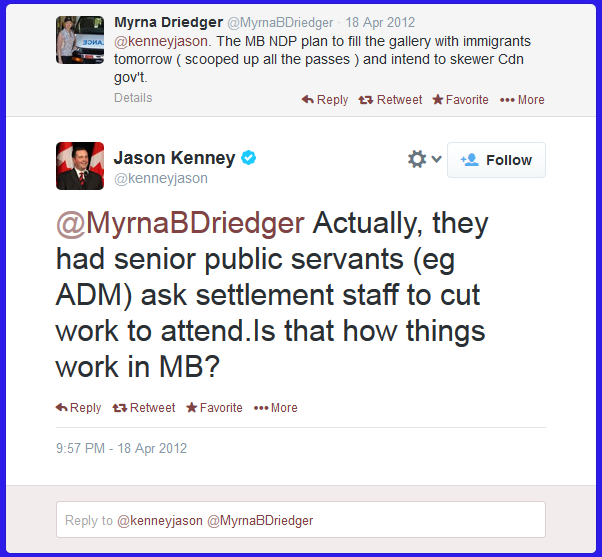 The Premier knew for many months that the Minister had lied, but failed to correct that lie himself. His excuse: the ombudsman’s report was ongoing and he “didn’t want to interfere with the investigation.” Yet, the report was completed a month before it went public and the Premier still failed to set the record straight. The Premier was taking an active role in preventing the press and voters from knowing the truth by allowing false information to remain uncorrected prior to the report being released, and after the report was released the Premier wasn’t talking. On December 12, the Greg Selinger was asked about the matter and dodged the questions. Again on December 14 he refused to address the issue. In a year end interview on December 18 Selinger says he “wasn’t entirely clear” at the time that Melnick was behind the emails, suggesting or implying that he knew little about them and that his office was not involved. Meanwhile Christine Melnick came out with her “undiagnosed diabetes” excuse, while denying repeated interview requests throughout late December and into January. Selinger was also refusing interview requests. Why did he sit on the report for a month? What did he personally know about the plan and what was his office’s involvement? If someone wanted to know the answers to these questions they would have to try to pin him down somehow, but the elusive Premier was not providing many opportunities for that. For example, one blustery evening in January, the Canadian Press found out that Selinger was meeting with a rural reporter in a restaurant in Morris. CP reporter Steve Lambert drove out to Morris to see if he could grab a few moments of Selinger’s time, but he was turned away and left standing in the cold with no answers. The interview requests continued to get rejected, so the next opportunity to question the Premier came at a press conference on January 29 in front of the legislative building (about 1 1/2 months after he last spoke to the press in Winnipeg). Once again he was questioned about the Melnick affair, and once again he was evasive, and cut short the Q&A when pressed on the matter. The whole incident was captured on film by local treasure Natalie Pollock, whom you might remember for such classic YouTube videos as Brian Pallister wishes Infidel Atheists a Happy Holiday. The best part of that video is the jazzy little tune that Natalie plays at the end while showing a photo of herself. That’s just priceless, especially when juxtaposed with the footage of a pissed-off Selinger. What you’ll also notice in the video is Selinger repeating “the record is very clear”. If we’ve learned anything from watching Stephen Harper responding to senate scandal questions, it’s that when a politician begins a sentence by saying something is “clear”, there is a whole lot more to the story than what the politician is saying. This incident also resulted in a Free Press story about the Premier cutting short the news conference, which perhaps embarrassed him into finally addressing the issue head-on with the Canadian Press. This is when things began unravel for the Premier. He went on record as saying that he and his staff “were not involved”, which prompted a rebuttal from Christine Melnick the very next day, directly contradicting the Premier, and naming specific people in the Premier’s office who were behind the original plan. The Premier kicked Melnick out of caucus and and continues to deny her accusations even though specific people in his office were named. So this is where we’re at: After months of digging and asking questions and requests for interviews and reports and more digging, we still don’t know exactly what happened, but we do know that the involvement goes a lot deeper than what we were originally told. We also know that at least one person is lying about what happened. Based on what we’ve seen, it is very possible that the Premier or somebody in his office organized the initial event, then an MLA committed a crime in lying to a committee to protect the Premier, and then was thrown under the bus when the pressure was on. That seems like a likely scenario, but will we ever know? Even getting to this point has been an aggravating and exhausting process for all involved. This is not how it should be. Governments should be forthcoming about what they’re doing and why. They should answer legitimate questions from the press. They should, in other words, be subject to accountability. Unfortunately this particular administration is making that extremely difficult. The evasiveness shown in questioning, the willingness to throw a loyal team member under the bus, and the poor judgement shown by the leader in not facing the issue when it first arose – all of this is eerily reminiscent of another recent scandal at another level of government. It is ironic that this all began with Greg Selinger angrily opposing what he portrayed as an ideological change made by Stephen Harper, when at the end it turns out that they’re not so different after all. ← Is the mayor a bully?